sery2831 wrote: Dorchester service will be starting the weekend after Thanksgiving. Huh. That's great news. Has there been a public announcement yet? Given that there's been official announcements for the other lines' weekend service resuming, it seems unlikely that weekend Fairmount service would begin without any press release. So my info was correct... Press release out. Again with the stupid "the vehicle IS the service" bloviation. Do they really think people care? This is a start. Weekend hourly is better than weekend nothing at all. But it addresses zero on the fare compatibility front other than removing the threat that they were going to end the Zone 1A experiment and raise fares back to out-of-sync with the subway. And the weekday schedule still doesn't budge from the system's shortest peak, hourly off-peak, and an extra-early bedtime. Or differentiate itself to look in any way like they plan to eventually follow through on actual high intracity frequencies vs. bait-and-switching it out to the suburbs by extending that verbatim schedule to Foxboro and calling it a day. The procurement for the first 30 Diesel Multiple Units (DMUs) will allow for greater train frequency without the expense or time of changing infrastructure. What infrastructure do they think would need to be changed to increase the frequency of the existing push-pull trains? Surgery to remove heads from posteriors is pretty expensive these days. All of the track work is 100% done. The only thing left to do is Blue Hill Ave. station, the platform raising to full-high at Fairmount, and the do-over of Readville into a 2-track island north of the switch. Lines with more archaic and lower-capacity physical plant than this do twice the peak-hour service right now today and achieve--briefly, at the peakmost hour of the day--very nearly 15-minute or better mainline frequencies on beastly 6-car push-pulls. There is nothing a DMU unlocks for the service levels. You can run Fairmount at 100% of the 15-minute clock-facing Indigo headways in the implementation plan on existing equipment. Not even the acceleration difference vs. push-pull matters when HSP-46's are ridiculously overpowered for un-full 4-car sets. The F40's are overpowered for un-full 4-car sets; they only start to suffer at 6+ cars, and trains where the cars are stuffed full of several extra tons of sardine-packed human flesh. The only thing the DMU's do differently is 1) lower the off-peak operating costs when only 1 car is needed but the push-pull minimum is 4 cars; 2) have a 2x2 instead of 3x2 interior seating configuration that's easier to navigate when doing quick on/off stops between pairs of close-spaced intermediate stops instead of just staying seated to the terminal; 3) ditching the second level of the bi-level which is likewise easier navigation for quick trips; 4) add a center door and possibly ditch the vestibules likewise making for easier navigation on quick trips. That's it. Reasons #2, #3, #4, #5 only matter after the clock-facing frequencies have been achieved...and achieved long enough for the ridership to actually develop around it. Below that frequency threshold people still ride it like a conventional commuter rail: plan your schedule around a paper schedule, and stay put to/from the terminal and your home stop...no trips and transfers between intermediate pairs. And...the ridership won't develop full-tilt around the frequencies until they fix the problem of no transfers allowed on a single fare; it's not "rapid-transit like" if you're forced to double-dip on that Red Line transfer. So until those thresholds are met there's nothing to serve here that a 3x2 seating, vestibule-boarding vanilla coach can't serve without any obvious shortcomings. "The vehicle IS the service" is a total lie. They can do this today. At the very least if it's gotta be stepped up slowly to 15 min. frequencies, how about throwing the line some bone on the weekdays so the frequencies aren't dregs-of-the-system awful? Weekend service is nice, but it still tiptoes around the real problem of refusal to expand the weekday schedule into something usable. If EVERY bus crossing the corridor still has higher frequencies than the train, no one will take the train. One more schedule increase at least stops it from being worse than ALL of the buses and gets it up to a point where it's only worse than some of the buses. That would be a much more consequential improvement. But they'd rather flood the zone with cynical signal-to-noise about buying expensive toys being an ironclad requirement to lifting a finger. It's a useful distraction maneuver to deflect from their complete unwillingness to meaningfully increase the service or fix the fare portability paper barrier. I don't understand the reasoning behind increasing service (tighter headways AND weekend service) on the Dorchester branch. It seems that even right now, rush hour fairmount trains never exceed two coaches worth of passengers. enterprise11 wrote: I don't understand the reasoning behind increasing service (tighter headways AND weekend service) on the Dorchester branch. It seems that even right now, rush hour fairmount trains never exceed two coaches worth of passengers. The first rule of Transit Club: more service is more attractive to riders. You can't get stuck in the circular logic loop of "nobody rides it so why bother with service?" If the transportation demand analysis of the corridor shows that there is latent ridership waiting to be unlocked, then you need to throw good service at it in order to unlock it. 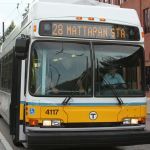 When the Fairmount line only runs once every 45-60 minutes at best, and when trips are frequently canceled, it becomes hard for riders to justify using it. That's not good service. That's terrible, unreliable service. Not to mention the complete lack of fare integration. That they still manage to fill up a coach or two with passengers is, I think, testament to how much latent demand is just waiting to be tapped along this line. Every stop on the Fairmount Line has buses, a lot of them running east-west to rapid transit transfers at Mattapan, Forest Hills, Dudley/Roxbury Crossing, Ashmont, or Fields Corner. The problem with the buses--and thus the whole reason for the Indigo corridor--is that they all require transfers to get downtown. And most of them cross at these stations east-west...there is no bus linking multiple Fairmount stops. So the train both defines a corridor full of stop pairs people want to go but have no options but convoluted multi-transfer buses, and offers up a transferless direct to downtown. BUT...every single one of these bus routes has equal-or-better frequencies than the train today. And some of those bus frequencies aren't very good at all. So it is still easier to take a painfully slow bus into a rapid transit transfer when the rider knows the rapid transit frequencies at the transfer are reliable enough...rather than take the train that runs once an hour, has a short peak period, costs more for the rapid transit transfer at South Station than any of the buses, and stops running earlier in the evening than the buses. You're still talking one more good-sized schedule increase before it's less-bad than the pretty bad bus options, and several more schedule increases before it's legitimately good vs. the buses and stepping up to something resembling critical-mass demand. So it's not an "if you build it they will come / we built it, why didn't they come?" thing. They know damn well what the demand profile is and EXACTLY what headways and fare portability tap that profile. They haven't started doing that. There is no mystery why the ridership is nonexistent. It's nonexistent until they start offering the frequencies. They know this. That's why "the vehicle IS the service" spin is so disingenuous. My perception is that the announcement of the purchase of 30 DMUs (that no US commercial carbuilder currently offers, but that's just a minor detail) was staged as another chance for Deval to remind us all how wonderful he is. Is he sure that we don't need another "study" or two? TomNelligan wrote: My perception is that the announcement of the purchase of 30 DMUs (that no US commercial carbuilder currently offers, but that's just a minor detail) was staged as another chance for Deval to remind us all how wonderful he is. Is he sure that we don't need another "study" or two? It's not even a purchase or bid process, just a RFP. They could easily just throw it in a file cabinet to collect dust after they get their specs back from the manufacturer.